Oracle Event Hub provides a managed Kafka PaaS solution. To access it from an on-premises client you have to make sure to enable the ports to Event Hub Zookeeper and the Kafka broker. First lets enable access to Kafka broker. To do so, check the OPC Event Hub service for the connect string. Then create a new access rule. Warning: In general you should not allow public access to access your Event Hub service! This is just for demo purposes to make the tool work. In case of doubt create a rule with your own IP address and talk your friendly security officer first of all. Voila, it is working 🙂 You can explore your topics or even create new ones. Note that Oracle Event Hub uses a special naming convention for topics. 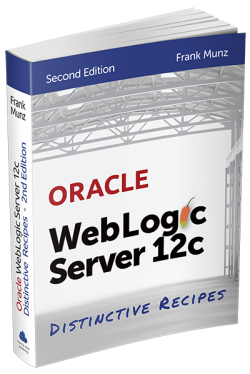 Oracle Event Hub topics created with the web console are automatically prefixed with the OPC ID domain. Event hub topics can be created via the Kafka command-line from any host (assuming you allow the clients to access Event Hub CS). These topics are not prefixed with the OPC ID domain. Topics created with the CLI (without ID domain prefix) are not shown in the service console. If you are planning to use Event Hub as a drop in replacement for another Kafka installation you won’t be able to create the proper topic names for already existing topics with the service console. You have to add the ID domain prefix in every client. This is particularly bad e.g. for a Java producer. Hard-coded ID domains will show up sooner or later in the source code. Being forced to use the ID domain prefix in every client might turn out to be a security issue. 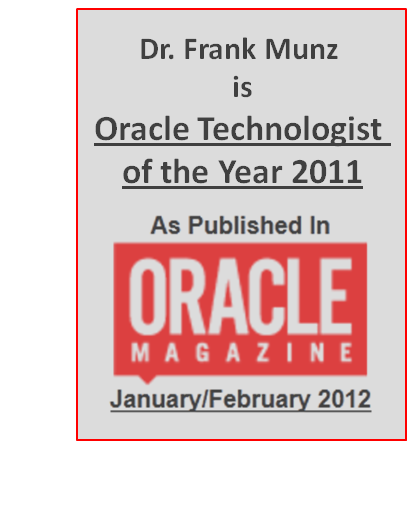 Did you note that most bloggers blacken their ID domains in screenshots when writing about OPC? 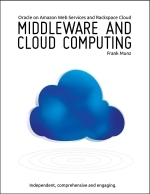 Oracle cloud is moving even more towards the generic cloud model that I described in 2011. What used to go with the name “Bare Metal” becomes the new norm now. This is good news: In addition to the regions and availability zones that you already know from AWS, the new stack will provide a flat, non-blocking network and NVMe storage. 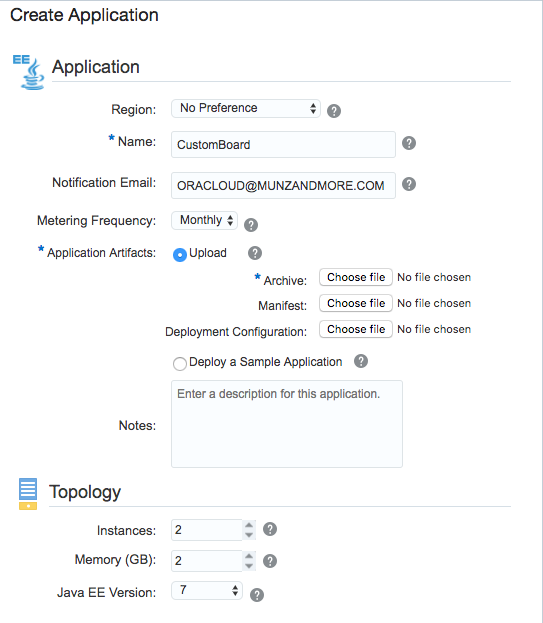 The Bare Metal Cloud Services user interface was updated to reflect the new name, Oracle Cloud Infrastructure. Also on September 26th, the Oracle Public Cloud user interface will be updated to reflect the new name, Oracle Cloud Infrastructure Classic. 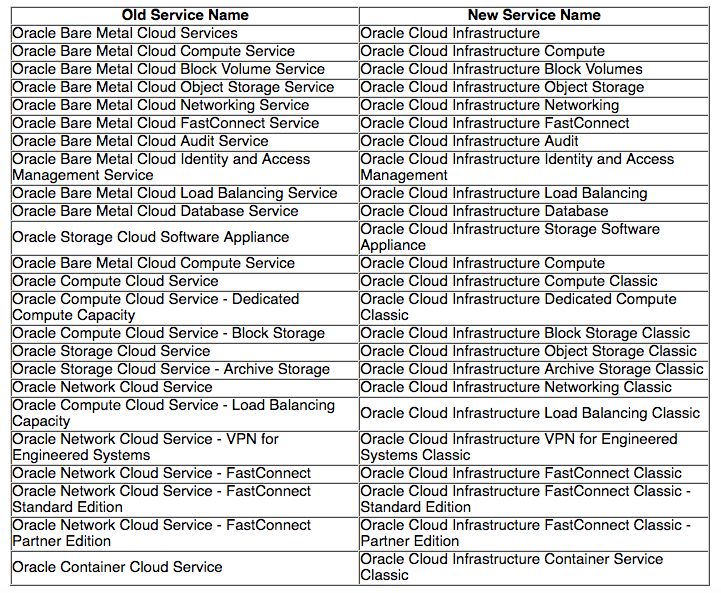 Oracle Cloud Service Names. Old Name. New Name. Classic.